Description A challenging physics-based game with unique mechanics about none other than swinging pumpkins. Guide the pumpkin to the ending candle with the vines located in each level. 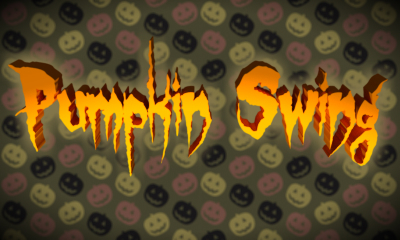 Collect candy along the way to unlock pumpkin customizations. Instructions Gameplay: Press any button to start Use ABX & Y to make vines Use the circle pad to swing Editor: Draw and drag with the touchscreen Use the d-pad to select the tools Use the circle pad to scroll the level Hold L to erase Drag the yellow boxes to resize the level Press A to play Press B to leave Notes How in the world did I get this done!? Also, please don't try to read the code. It's incredibly sloppy at times. Hold down L and R while tapping on "New Game". This will activate no candy mode. Every level can be beaten without collecting a single piece of candy. I have no clue why I added this. 25 Comment(s) TheV360 Pokemon Is Awesome! I love Pokemon! Express Yourself First Day Joined on the very first day of SmileBASIC Source Website Night Person I like the quiet night and sleep late. Express Yourself 6 months ago Really really nice game. I love the use of the additive sprites for the jack-o-lantern effect, and the physics are very impressive, and they're of a quality I didn't expect in a SmileBASIC game. My only nitpicks are some slight polish to the menus and feel. When I tap another level on the level select while the screen is fading, the level shouldn't be pressed down. When the screen is transitioning to the next level and I missed some candy, I often try to click the Retry button as it fades out, but it only moves on to the next level. Finally, I feel like the bat sliding down -> actual control cooldown is a bit too long, especially after retrying a level for the 20th time just to get that single candy in the corner. 9/10 funky game SwanBot Halloween 2017 Contest Runner Up I placed 2nd in the SmileBASIC Source Halloween 2017 Contest! Programming Contest Intermediate Programmer I can make programs, but I still have trouble here and there. Programming Strength First Year My account is over 1 year old Website 6 months ago Took me till the 8th level to realize that you could use the circle pad... Nathaniel OSP Contest 1 Contest Participant I participated in the first SmileBASIC Source OSP Contest! OSP Contest 2 Contest Participant I participated in the second SmileBASIC Source OSP Contest! OSP Contest 3 Contest Participant I participated in the third SmileBASIC Source OSP Contest! 6 months ago How'd you get past level 6? SwanBot Halloween 2017 Contest Runner Up I placed 2nd in the SmileBASIC Source Halloween 2017 Contest! Programming Contest Intermediate Programmer I can make programs, but I still have trouble here and there. Programming Strength First Year My account is over 1 year old Website 6 months ago So if you just hold down the button you are swinging on it will slowly swing farther and more. took a few minutes but I finally got it. you can go to at least level 9 that I've tested with it. Nathaniel OSP Contest 1 Contest Participant I participated in the first SmileBASIC Source OSP Contest! OSP Contest 2 Contest Participant I participated in the second SmileBASIC Source OSP Contest! OSP Contest 3 Contest Participant I participated in the third SmileBASIC Source OSP Contest! 6 months ago Oh wow! I just checked every level to see if each one could be beaten without using the circle pad and the only level that, as far as I know, can't be beaten is 3-3. Simeon Scholar Received for knowing a great deal about programming topics Achievements Amazing Page Hidden Achievements Drawing I like to draw! Hobbies Edited 6 months ago Clever game mechanics. Attention to detail. Consistent code. The difficulty seems reasonable. Honestly this is a masterpiece. Your coding style (specifically naming scheme) is very clear and easy to read, and I think there's a lot we can learn from your style. You should consider making tutorials to show some of your tricks to designing games! Congrats on creating a 3DS gem!! 12Me21 Syntax Highlighter Received for creating the code syntax highlighter on SBS Night Person I like the quiet night and sleep late. Express Yourself 6 months ago Lol I didn't realize you could use the circle pad until level 5... I spent so much time getting the special candy in level 4 using just the buttons IAmRalsei Forum Leader Hidden Achievements First Year My account is over 1 year old Website Expert Programmer Programming no longer gives me any trouble. Come to me for help, if you like! Programming Strength 6 months ago Yeah, me too. spaceturtles Video Games I like to play video games! Hobbies Avatar Block I didn't change my avatar for 30 days. Website Intermediate Programmer I can make programs, but I still have trouble here and there. Programming Strength 6 months ago try doing it with the nub instead random_god Intermediate Programmer I can make programs, but I still have trouble here and there. Programming Strength QSP Contest 1 Contest Participant I participated in the first SmileBASIC Source QSP Contest! Video Games I like to play video games! Hobbies 6 months ago lol HTV04 Intermediate Programmer I can make programs, but I still have trouble here and there. Programming Strength Avatar Taboo I didn't change my avatar for 180 days Website Second Year My account is over 2 years old Website Edited 6 months ago This is awesome! I just played through the entire game, and I have to say, the last level was the hardest one of them all (just kidding, lol). This game was really well designed, especially for a game made in just a month. Seriously, this is really impressive work, and the game itself is very enjoyable. I didn’t really find the levels that difficult, although they did prove to be challenging. The editor is also very user-friendly, I like how it tells you what items are needed for a level to be possible, rather than just letting the player find out for themselves after they’ve already saved it. I can’t wait to see what levels people create with it! All in all, this is an amazing game. You have my vote! random_god Intermediate Programmer I can make programs, but I still have trouble here and there. Programming Strength QSP Contest 1 Contest Participant I participated in the first SmileBASIC Source QSP Contest! Video Games I like to play video games! Hobbies 6 months ago Yeah! This game is really cool! I love the editor, but one thing I want is a thing that lets you play in the editor and leaves a trail to make it easier. auceps 6 months ago nice game but how long did you spend on it? 12Me21 Syntax Highlighter Received for creating the code syntax highlighter on SBS Night Person I like the quiet night and sleep late. Express Yourself 6 months ago Nice game what's the key? IAmRalsei Forum Leader Hidden Achievements First Year My account is over 1 year old Website Expert Programmer Programming no longer gives me any trouble. Come to me for help, if you like! Programming Strength Edited 6 months ago Time:12 Days (thank you, ProKuku) Key:22TE8AE ProKuku QSP Contest 1 Contest Participant I participated in the first SmileBASIC Source QSP Contest! 6 months ago At the bottom of the code for the main PRG it says there were only twelve days spent making it. DFrost Expert Programmer Programming no longer gives me any trouble. Come to me for help, if you like! Programming Strength 6 months ago No way you won't get first place! this is PERFECT! my game is trash compared to this masterpiece! random_god Intermediate Programmer I can make programs, but I still have trouble here and there. Programming Strength QSP Contest 1 Contest Participant I participated in the first SmileBASIC Source QSP Contest! Video Games I like to play video games! Hobbies 6 months ago Good game! I have some competition! IAmRalsei Forum Leader Hidden Achievements First Year My account is over 1 year old Website Expert Programmer Programming no longer gives me any trouble. Come to me for help, if you like! Programming Strength Edited 6 months ago Downvoted because: 1-5 is too damn hard It’s not obvious you can change the swing direction Not fun A legendary company indie game creator made this bad game The editor crashes immediately ProKuku QSP Contest 1 Contest Participant I participated in the first SmileBASIC Source QSP Contest! 6 months ago A level being too hard to beat is a retarded reason to downvote a game. IAmRalsei Forum Leader Hidden Achievements First Year My account is over 1 year old Website Expert Programmer Programming no longer gives me any trouble. Come to me for help, if you like! Programming Strength 6 months ago And now you prevented me from removing it from the list which I would if you replying didn’t stop me from editing my comment Nathaniel OSP Contest 1 Contest Participant I participated in the first SmileBASIC Source OSP Contest! OSP Contest 2 Contest Participant I participated in the second SmileBASIC Source OSP Contest! OSP Contest 3 Contest Participant I participated in the third SmileBASIC Source OSP Contest! Edited 6 months ago A) I only gave myself a day and a half for level design so it was hard to get the difficulty curve right. B) The editor is meant to be unlocked after beating the game for the first time. (I should probably change the crash to a note to the player) I'll try to fix both of these problems before the end of the contest. Please consider retracting your down-vote. I'm working very hard to make this game enjoyable. IAmRalsei Forum Leader Hidden Achievements First Year My account is over 1 year old Website Expert Programmer Programming no longer gives me any trouble. Come to me for help, if you like! Programming Strength 6 months ago Okay. Downvote removed. 12Me21 Syntax Highlighter Received for creating the code syntax highlighter on SBS Night Person I like the quiet night and sleep late. Express Yourself 6 months ago lol DFrost Expert Programmer Programming no longer gives me any trouble. Come to me for help, if you like! Programming Strength 6 months ago looking forward to playing. Hope u win!